Go to the tab Staff - > Select a profile and you will be able to set any of the following permission levels for that user. Employee only has the Read-Only access to information that you have shared e.g. Schedule, time Clock, Reports, and Profile etc. Scheduler permission level can be best defined as Shift Manager. 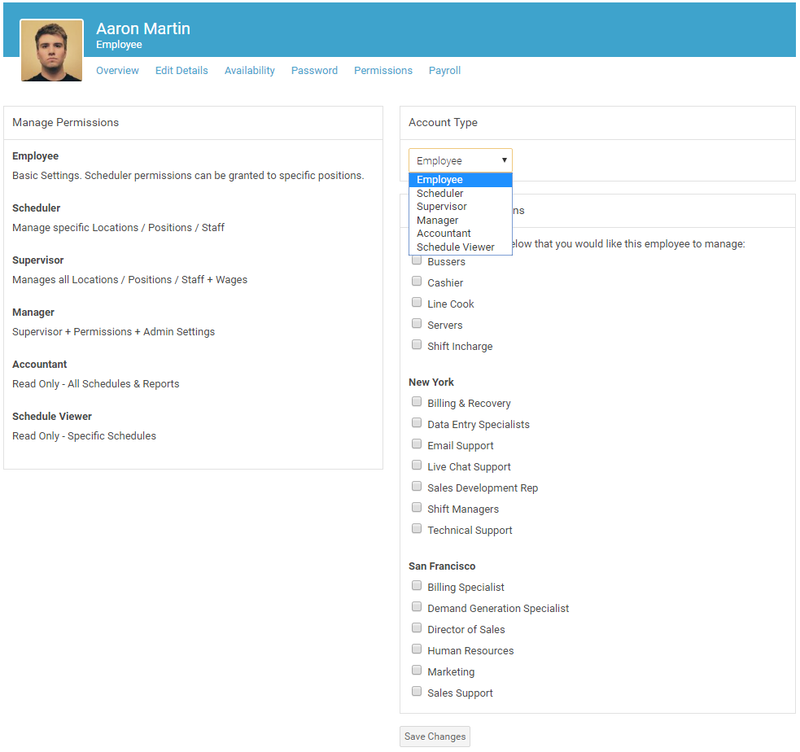 Check the positions Under Account Type field to allow that user management of certain positions. The scheduler will then have permissions to manage Shifts, requests, Approval, Time Sheets, Availabilities, and Vacations requested for those positions. Along with the above authorities, schedulers can also have access to employees' wage information, the budget feature on the schedule and payroll reports, if allowed by the management. These settings can be found within 'Payroll' module > 'Advanced Settings'. A Scheduler can also be permitted to add and remove staff for the positions that 'Scheduler' can manage. The setting can be found in 'Settings > Account > Advanced Settings > Staff Settings > Schedulers can create users and delete users under their permission'. 'Supervisor' has read/write access to every module/feature, but 'Supervisor' does not have access to 'Settings' panel as well as 'Supervisor' cannot change permission and password of 'Administrator' including users with 'Manager' access. A Manager has full access to the entire application. A special permission level for members who should only have read-mode access to Schedule tab. No other tabs will be visible. Another special permission level for members who should only have access to Schedule and Reports. All other tabs will not be shown.